After mentioning the LG KE850 in my last post, I thought it silly not to give you some information about this handsome beast. First off... a word on the looks. 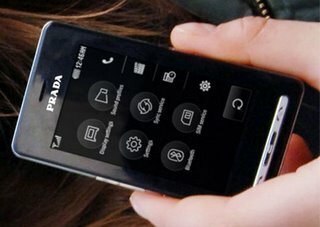 Prada is known for understatement and this continues into the design of the new phone. While the iPhone is pretty tasteful itself, Prada's creation, with it's technochiaroscuro, is very subtle indeed. There are none of Apple's 'garish' colours - just black and white. LG have also released a non-Pradafied version of the phone, which will undoubtedly carry a far more reasonable price tag but isn't so chic. You could be forgiven for thinking the LG KE850 is a knock-off of the iPhone but that would be incorrect. The two phones have been in development simultaneously and both manufacturers clearly shared a desire to push mobile design forward, removing the need for the wands which have always come with touchscreen handsets (and generally gone missing at an inopportune moment). For me, the most attractive thing about the KE850 is the onboard camera - a Schneider Kreuznach lens ensures high-quality optics (they make Kodak's lenses). In addition to the fancy-sounding lens, the KE850 has an LED flash, making it possible to take high-quality photos late at night. Tabloid gossip columns are said to be delighted. 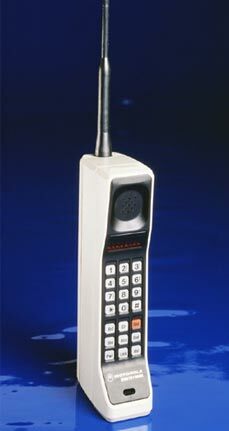 Other good news is that the handset weighs just 85 grams - 50 grams less than the iPhone. The KE850 measures 99 x 54 x 12mm which is a bit smaller than Apple's offering. Unsurprisingly for such a compact, stylish handset, some features have had the chop - namely 3G (of which I am a huge fan) and wi-fi (which is also pretty damn useful). All in all, this is one of the most desirable handsets on the market in 2007. Now start saving!